October in Northwest Indiana is a visual feast of blazing colors that almost seem impossible that they happen. 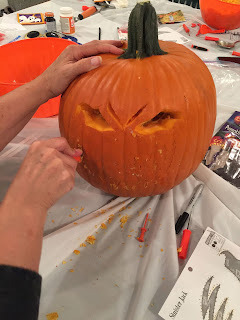 On the day I’m writing this blog, I’m helping to prepare for my friend’s Pumpkin Carving party. She’s not all that well right now, and though we are praying for better days for her now and after an extensive surgery, for now, she’s tired. So, I got up at six this morning and I’ve been cooking and baking and gathering things to take to her house. 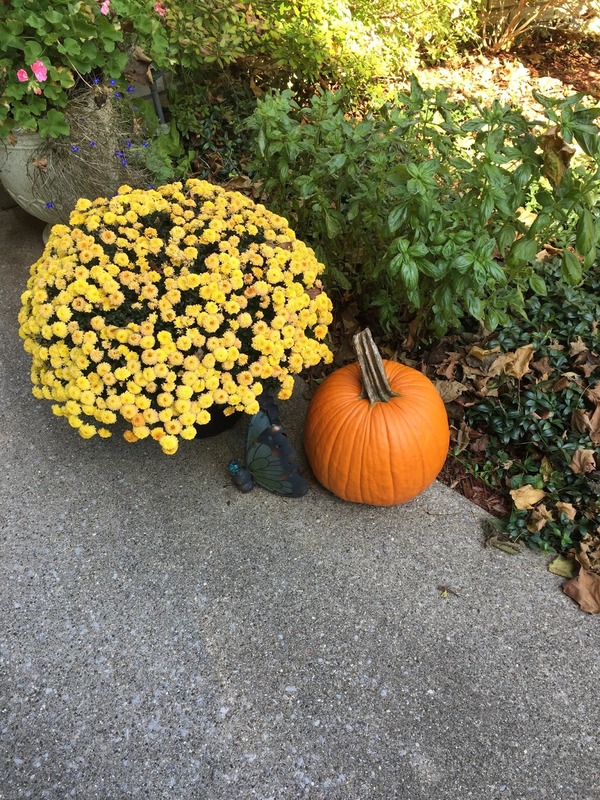 SHE has the double garage with a fabulous painted pale blue floor with sparkles in it , no less—where we will carve the pumpkins. I know there are many people who disdain the continued celebration of Halloween, though as a child all I thought about was the candy I’d have at my disposal that would carry me through to Christmas. I’ve always loved the nostalgia of Halloween, the decorations, donuts and cider and when we were kids we went to a neighbor’s house. The lady there, Mrs. Parker, always made a pumpkin cut out cookie for every kid in the neighborhood and wrote our names on the cookies. She was the sweetest woman and being back in the “old neighborhood” …I miss her. 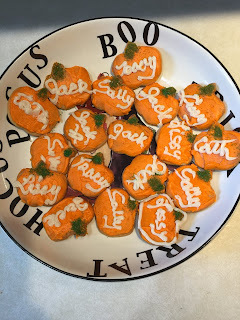 So, every year, I make pumpkin spice sugar cookies and write my friends’ names on them. As you can see, I need cake decorating classes. Carving a pumpkin was always a challenge to me. I’m so, so not artistic, so I depend on the patterns in the books I buy at the drug store or Walmart. The pumpkin you see above will come back home with me with something genius believe me. That’s because an actual artist designed my pattern. However, my one thing I always do is “glitter” the pumpkins. I know. I’m so aware of it. I just like sparkle in everything. So, spray glue and gold glitter this year. Our results are below, but my glitter didn't sparkle all that much. Oh, well. There's always next year. At work the other day, one of the assistants brought in a prayer you can pray while carving the pumpkin. I thought this was so lovely, I wanted to share it with you. Lord, take out all my fussies and frownies, and fill me with your love. Lord, help me to always speak your words of love and wisdom. Today is the launch of my Prism book tour for RESCUED BY A FIREFIGHTER. I hope you get a chance to hit one of the “stops” and tell your friends as well. It’s a fun tour..as they always are. And check my facebook page for giveaways through November. 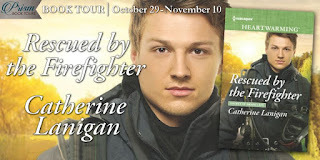 www.prismbooktours.com @cathlanigan on Twitter and Cathlanigan on Facebook. What kind of traditions or non-traditions do you have for Halloween? Not just the kids, but for YOU? I love hearing these "visits" into your lives and memories about holidays. I wish you all a blessed and happy Halloween filled with memories and making new memories. Oh, I love this post, Catherine! Good luck with the new release and the tour. I'm going out to "visit" you now. Thanks, Liz! I love this little prayer and I think it's a positive way to look at Halloween. 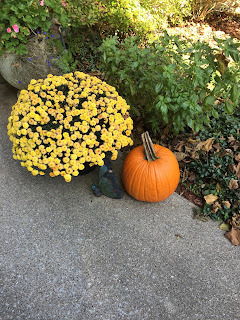 I can't believe October is nearly gone. And time to think of Christmas shopping! Have a fabulous week. What a wonderful post! I'm going to print out the pumpkin prayer. I'm not artistic either and my pumpkins are all simple. I'll have to try and find a pattern sometime. I thought this was the sweetest thing and gave me a whole new perspective on Halloween. I don't get many trick or treaters anymore. From the look of it you have more carving talent than you give yourself credit for. And how great to make the cookies with names. I miss having kids come around to trick or treat. Before I moved to this townhouse we always had about 100 kids. The last few years 0. But our churches do trunk-or-treats in their car park areas. Hi, Roz, I don't have many kids at all anymore. I go to my girlfriend's house and we get dinner take out or order a pizza and wait for the kids to come. She gets at least a couple dozen. Thank goodness. All the best with your Prism tour and your new release. Congratulations! 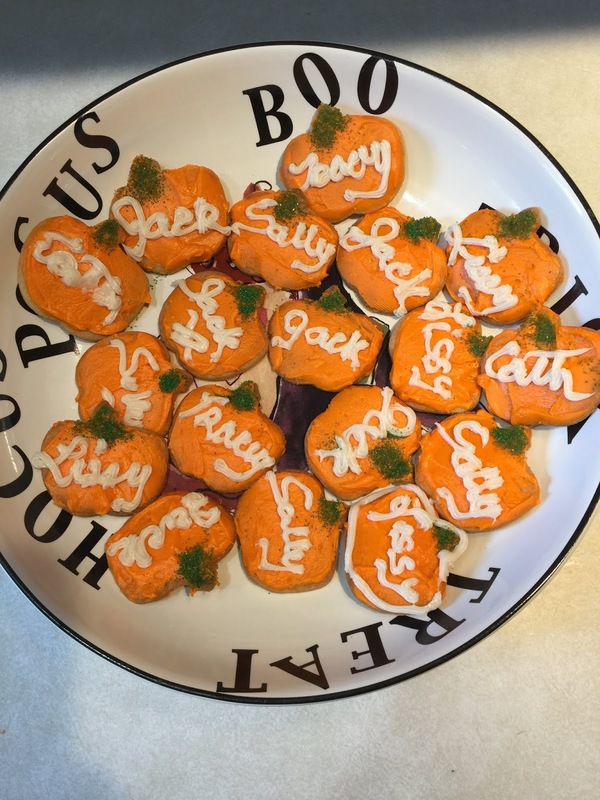 I love the pumpkin prayer, and the beautiful pumpkins and cookies you created. I have great memories of trick-or-treating with my best friend who lived in town (I was on a farm) and one neighbor of hers who made popcorn balls. I remember a girl scout Halloween sleepover with apple bobbling and scary stories--so fun. And for my own kids, designing costumes that would go over snowsuits so they could trick-or-treat in Anchorage where it always seemed to snow just before Halloween. No trick-or-treaters in my neighborhood now, although I bought some candy, just in case. Have a wonderful time with your friends, Catherine. I'm off to the tour. Hi, Beth! What great memories you have. Halloween used to be so much fun and it's lost a lot of it's magic and its not just the candy. But I love the lights and the mums and the popcorn balls....my favorite! Hi, Cathy and thanks. I love this tradition. I do it for Valentine's. I have to admit that the older I get the harder it is to write the names and squeeze out that icing. Happy Halloween. You're a good friend! And I think there are ways to find the good in Halloween, too. I like that pumpkin prayer very much! I'm not the biggest fan of Halloween but try to hide that to make it as wonderful as possible for my son. We carve pumpkins the day of Halloween because it's really hot where we live at this time of year and our jack-o-lanterns get moldy very quickly as a result! Your new book looks so good, I hope you enjoy the blog tour and having your story out in the world!